As Senior Move Managers we specialize in assisting older adults and their families with the emotional and physical aspects of relocation. We have the expertise and resources that save money, reduce stress and produce quality results. Our services are personalized to meet each individual client’s needs and preferences. We try and keep familiarity by making the new home a mini version of the old. Organize2Minimize is a professional organizing company specializing in personal and business organizational needs. Working alongside individuals, small businesses and families we help create systems that are easy to use and maintain. We work with every budget either using readily available resources or working with designers to create personalized systems. Realtors, Attorneys, & Communities trust us for their clients or families who need assistance with liquidation of belongings following the death of a relative/friend or move out unwanted items left in the home. We can help arrange determination of value of household goods and arrange for sale of valuable items through estate liquidation, auctions, or consignment. We can arrange for pick up of remaining items that you choose to donate and provide you with the receipt. We take great pride in being apart of the NASMM move managers community. We Work with a number of great companies to provide the best, customized care we possibly can. I would highly recommend Organize2Minimize to help you get organized. Emma Jalouga and her team were professional and efficient from my first contact to the follow up after my project was accomplished. I contacted O2M to help me organize my garage which to me was a daunting task that I had been putting off for years. Emma and her team made me feel much more at ease about the process and helped me through every step of the way. What had taken me years to tackle took about 6 hours to accomplish, not to mention the peace of mind. They worked around my schedule which was very important to me and they were always professional and polite. I have personally recommended them to several friends and neighbors and I am looking forward to using them on future projects. Thank you, once again for getting me organized! You are always so professional and energetic! From start to finish you made me feel comfortable and at ease with getting rid of many items. I love the way you put things in order and tidy up after you are finished! 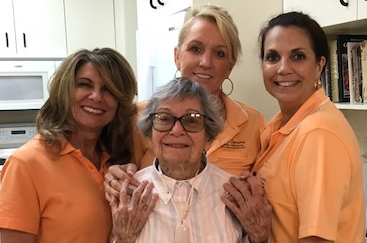 I would highly recommend your service to anyone who needs help getting things "right"
​My 96 year old Mom was moving from a pretty large two bedroom to a small one bedroom and was surrounded by years of "stuff". Emma and her Crew 'came, saw and conquered' what was a scary event for my Mom and made it pleasant. Measured, evaluated the new floor plan and what would work, came back and packed, then on the day of the move took over and set up the new home so it was just that - HOME! We totally appreciated this professional and thorough team and would use them again in a heartbeat! Thank you all!